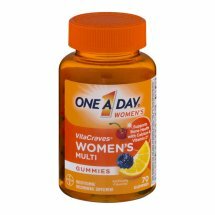 One A Day Women's VitaCraves Women's Multi Gummies - 70 CT.
One A Day® Women's VitaCraves® Women's Multi Gummies. Supports bone health with calcium & Vitamin D*. Please call 1-800-800-4793 (Mon-Fri 9AM - 5PM EST). Bayer, the Bayer Cross, One A Day and Vita Craves are registered trademarks of Bayer. Glucose Syrup, Sucrose, Tricalcium Phosphate, Gelatin, Water, Maltodextrin; Less Than 2% of: Artificial Flavors, Ascorbic Acid, Bees Wax, Carnauba Wax, Citric Acid, D-Biotin, FD&C Blue #1, FD&C Red #40, FD&C Yellow #6, Folic Acid, Potassium Iodide, Pyridoxine Hydrochloride, Vegetable Oil (Coconut Or Palm), Vitamin A Acetate, Vitamin B12, Vitamin D3 (Cholecalciferol), Vitamin E Acetate, Zinc Sulfate. Contains: Wheat, Tree Nuts (Coconut).